The main purpose of supervisor feedback form is to provide information about the supervisor’s performance regarding his area of work. As a supervisor is an important part of an organization, supervisor feedback form is essential in organizations. Such a form facilitates communication between a supervisor and an employee. The form allows an employee to provide constructive feedback about the supervisor which will help in improving the supervisor’s skills. The supervisor feedback form contains assessment in areas of leadership, work management, employee management and interpersonal skills. This overall assessment of the supervisor is done to improve his performance in the organization. Such an assessment should be conducted periodically in all organizations. 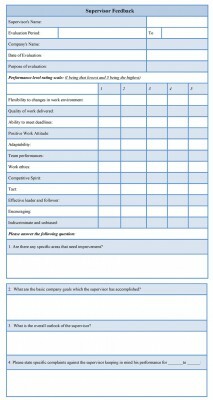 Example of a supervisor feedback or survey form is given below. You can download the free sample supervisor feedback template available online in either MS Word or Editable PDF format. Edit, customize and print as required. The Training Instructor Feedback Form is a standardized form that is filled by the trainees of the program. The Training Evaluation Feedback Form helps in reviewing the training program. It also helps in development of trainers and improving their training skills. Free feedback forms enable users or customers to give direct feedback about the product or service through websites. 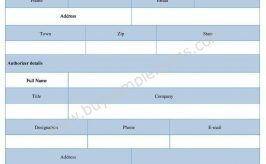 The Corporate Event Feedback Form is used to evaluate the strength and weaknesses of the corporate event. The main objective of 360 degree form is to get feedback from various perspectives about the employee.